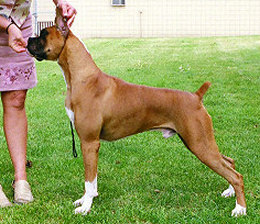 Romeo's first foray into the ring at just a few days over six months of age saw him win Best Puppy in Group Sept 17th, 2004 and BOS on Sept 18th 2004 AND Best of Breed Sept 19th 2004! He finished his Championship July 16th 2005 and as a Special the next day took the breed & 4th in Group! Watch for him.